RAW Bloom is a special blend of soluble plant nutrients proven to be an optimal choice for horticulture fertilizers. Includes all twelve RAW essential elements and supplements in one easy to use blend. Raw Bloom is higher in phosphorus and potassium which is needed in the flower/fruit stage. RAW bloom is recommended for use throughout the entire flowering stage. 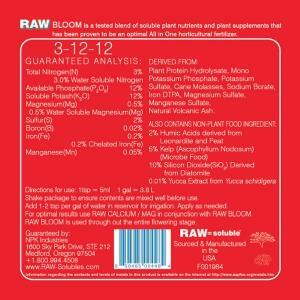 We suggest using RAW Calcium/Mag in conjunction with RAW Bloom for optimal results.